In the last three and a half years, I have primarily worked in the acrylic medium using strictly brushes on canvas. The only two exceptions to that were an abstract piece I did, trying out different mediums, and an an acrylic portrait of Bob Dylan done on watercolour paper. For some reason, I decided to try a large painting using a completely different technique. As I approached the large portrait of country music legend Waylon Jennings, I wanted to try a few dark shades of full body paint to do the background. 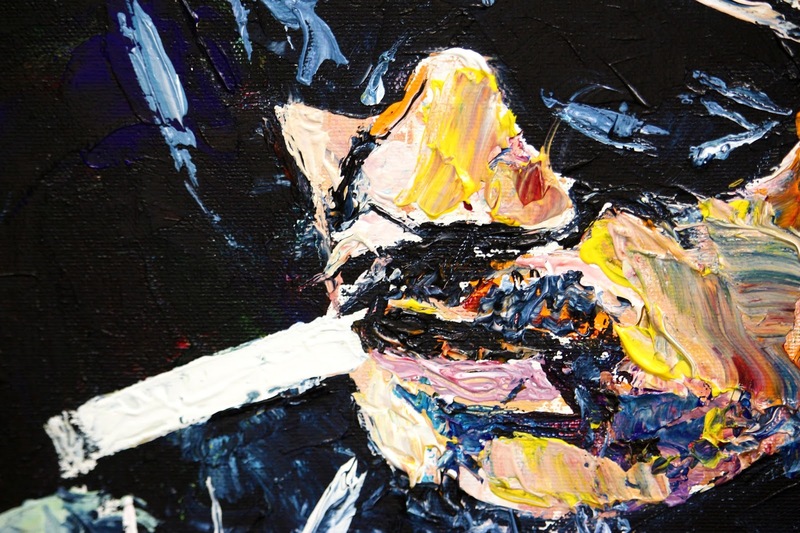 Rather than picking up the brush and starting to apply the colours, I picked up a palette knife. At first, it was a little like trying to write with your opposite hand. I have four different palette knives that were given to me one Christmas, a gift from my father-in-law Neil. I have been wanting to use them for a long time, but didn't know where to start. Coming off the 18 Day Painting Challenge, I felt energized to try something untested and adventurous. I'm going to do the whole thing with knives, I thought to myself. In fact, I couldn't see a path to NOT doing it that way. The texture created in the background is like a language; it felt wrong to switch to a different language midway through the project. I've always been attracted to loose and textured paintings on Instagram. The language of knife painting has always spoken to me. 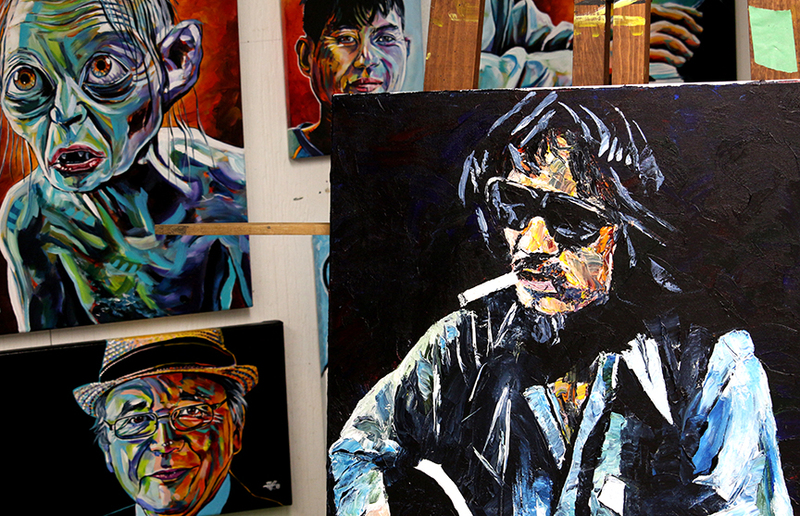 This painting of Waylon Jennings is my introduction to a new way of communicating with colour. After my two cups of coffee (my morning ritual), I will head out to the studio to finish the details of the guitar and hands. 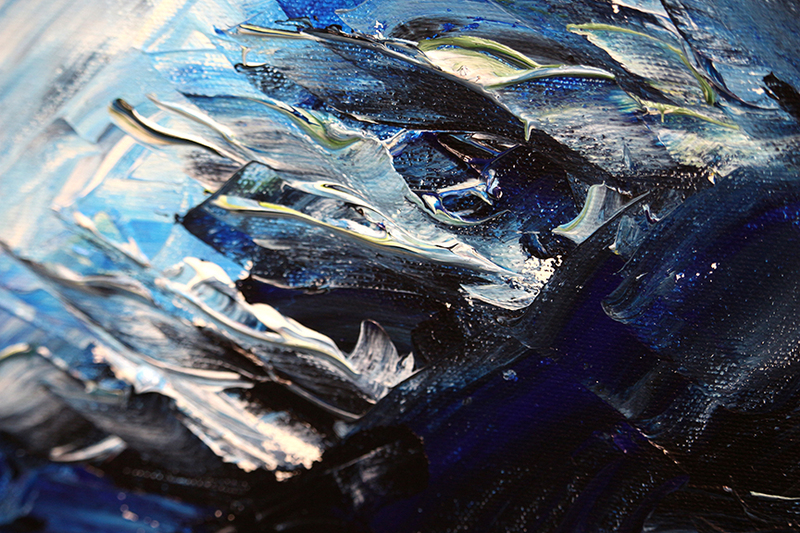 I'll also see what it is like making changes on paint that has been layered on the canvas. It should be fun. 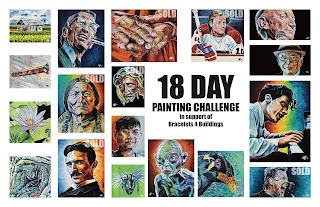 At 9 am, the 18 Day Painting Challenge online auction will begin. 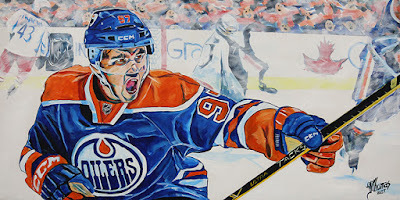 There are 12 paintings from the challenge up for grabs along with 5 other pieces that I've added including a print of Connor McDavid's portrait that I did down in Edmonton last April. 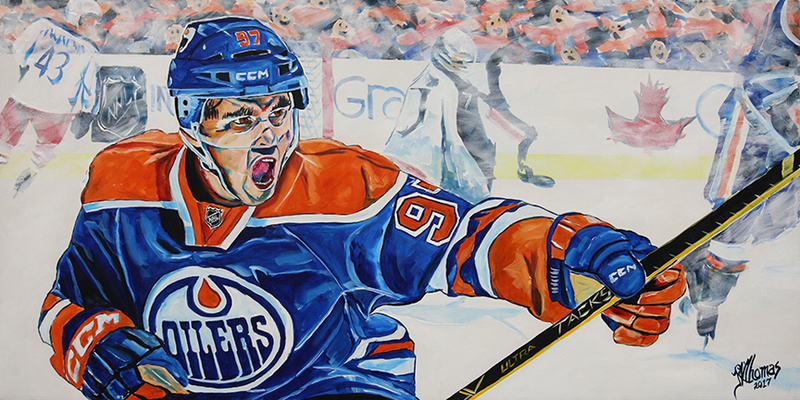 It sold on auction for $18,500 in support of Alzheimer's research. Proceeds from the sale of the 12 challenge paintings will go directly toward the house build with Bracelets 4 Buildings. As always, net proceeds from the sale of prints support all of our charitable, community and humanitarian efforts. To check out the auction and bid, visit 32 Auctions and register for free by clicking here.